Arsenal head coach Unai Emery admits Manchester City manager Pep Guardiola is the better coach, but is looking forward to locking horns with his former foe at the Emirates on Sunday. 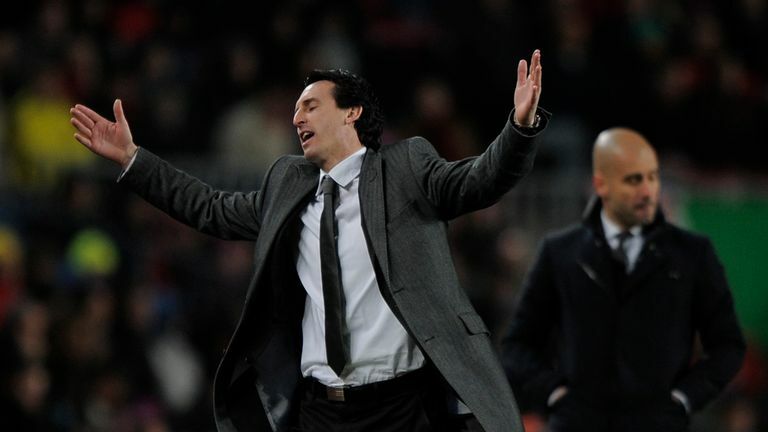 Emery takes charge of his first competitive game as Arsenal boss with Guardiola in the opposing dug out - a coach the former Valencia and Sevilla head coach has failed to beat on 10 occasions. The new Arsenal boss admits Guardiola has shone more both as a player and manager, but has welcomed the challenge posed by his counterpart ahead of Sunday afternoon's showdown, live on Sky Sports. "I am 46, he is 47 and he started his career as a player, bigger than me," said Emery. "His career as a coach is also bigger than mine. "We started our careers as coaches at maybe the same kind of time and his career, statistically, is better than me also but I like more playing against him because it demands more from the preparation, to try to win against his teams. "When we were in Spain each match against Barcelona with Valencia is very exciting and very demanding for me also to prepare this match." Aaron Ramsey is fit to play in Sunday's game after recovering from a calf problem sustained in a pre-season friendly against Chelsea. Emery also said Ainsley Maitland-Niles is expected to start at left-back, a position he filled in at last season, with Saed Kolasinac sidelined for two months and Nacho Monreal only returning to training on Friday after picking up a knee problem at the World Cup.